The track shuttle function, for example, is too unconventional and not even something adopted by sound editing software currently in the market. There has been no major change to the Shuffle modes since v2, other than a terminology change to use the word "Category" instead of the older "List" (which people often got confused with the more specific term "Playlist"). Do you use the category "Album Artist" ? No because I'd like to drill down from Genres first. 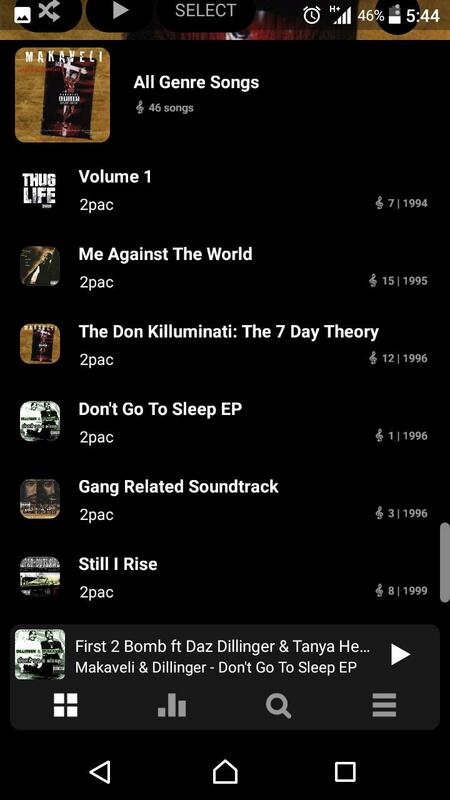 The sorting by Album Artist was available in v2. They are referring to seeing album artist tag when looking at the album instead of artist tag. 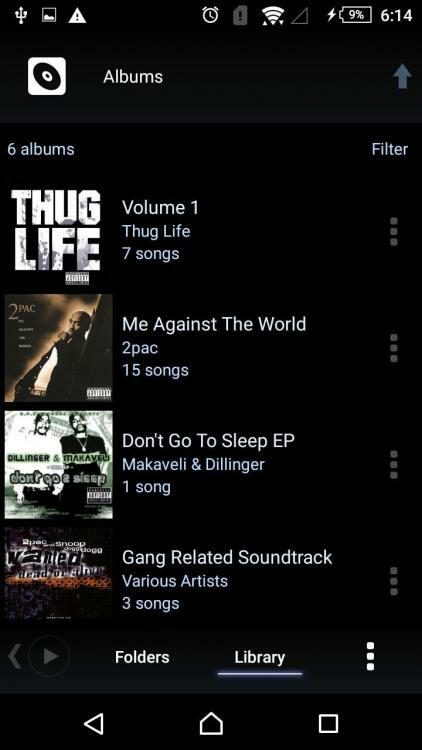 Option Doesn't display when viewing albums. 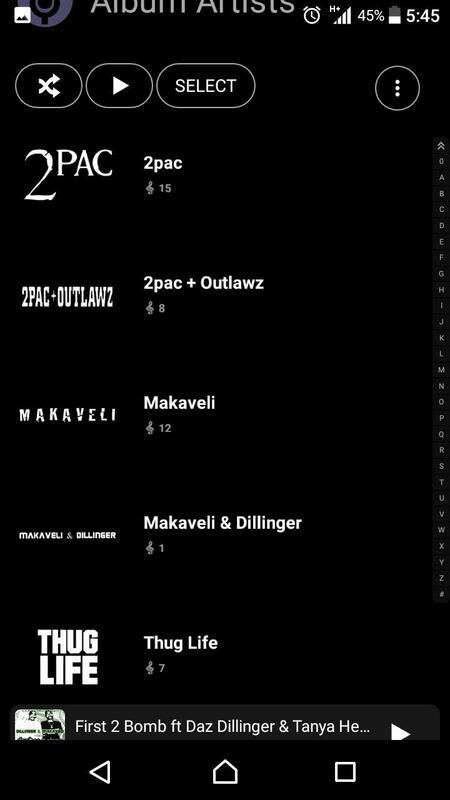 Only individual songs. @tukanglistrik albums can be grouped either on Artist tag or Album Artist tag, but not on both (in one list). 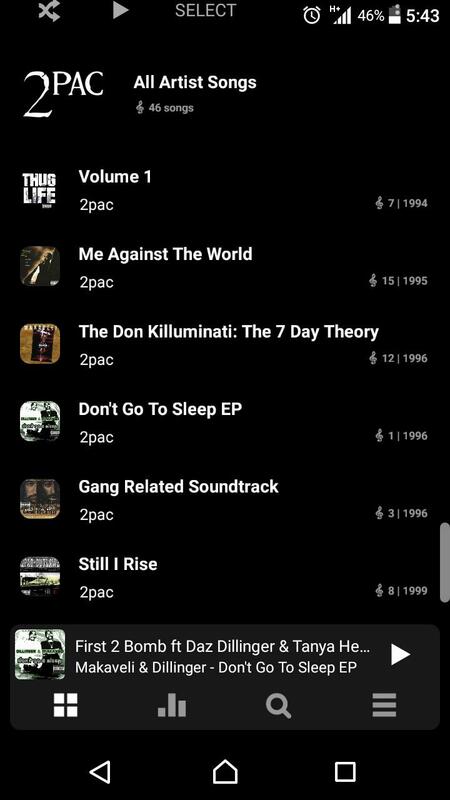 Meaning, if Poweramp based all albums on Album Artist, all the songs without album artist tag would go to Unknown album - this is breaking change for many users. 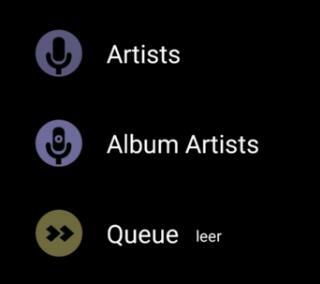 Grouping albums by both Album Artist and Artist tag in one list gives unpredictable results if some songs has no album artist (==for most song collections in the wild). Poweramp v3 supports separate Album Artists category and it can also show Album Artist tag instead of Artist for tracks (option). @lanriel not reproducible. You device/android version/ROM if any? Any dpi / scale / smallest width dp tweaks? Bluetooth (on Java output and OpenSL) not functioning after update (OnePlus 3, Android 8.0). On two different Bluetooth devices (reciever and headphones) next song in album only plays for a split second then stops. It had been much better in previous releases. On openSL Bluetooth randomly skips songs/stops/changes song early. Especially when on headphones out running. Workaround was to use Java output. @maxmp Thanks so much for the change to "always keep notification"! It works now, and you fixed it so quickly! @maxmp I noticed a possible bug that I don't think was there before. 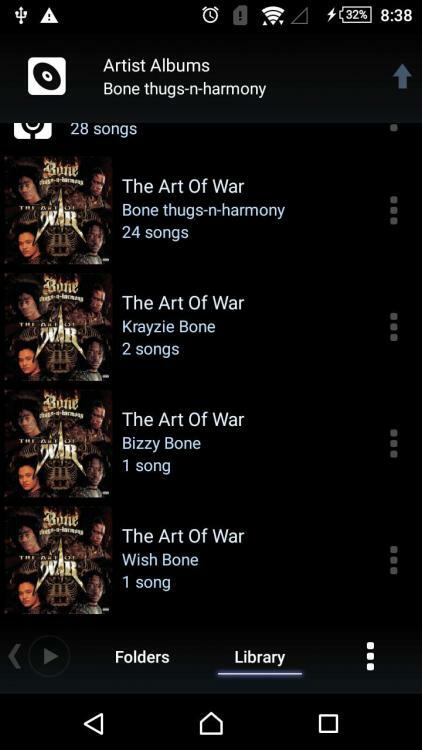 When you open the player, then pause the song, and then swipe Poweramp away. Look back at the widget, after a couple seconds it will glitch and say <<no song loaded yet>>, then it will return to the info as before. It happens every time on multiple devices. I heard quite a few users complain about this bug, but in previous versions I never had this problem. 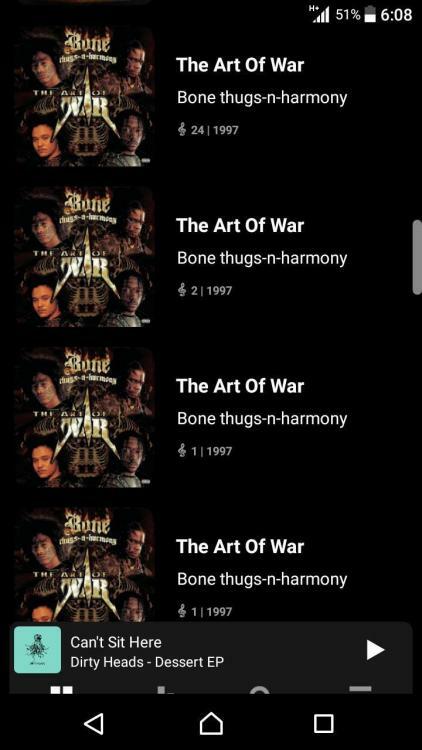 Now after doing a clean install of build 813, the now playing track in the mini player when browsing my library never show the track that is actually playing. See the attached image. now none of my skins work. Welcome to the club! Joking aside, Max said it didn't happen on his own devices either, maybe it will now and he'll be able to fix the bug for everyone. Thanks Max! I don't remember how it was in v2 and I can't reproduce it as it has been upgraded to v3 now. But I guess yeah there was an option to switch grouping to Album Artist, so drilling down from any categories e.g. by Genres would always sort by Album Artist (but still separated by Album). Those that don't have Album Artist were tagged with "Unknown Artist" but still grouped by Album. The tracks list and now playing showed the Artist. Album Artist category doesn't really work for me as it would show all songs I have (20000+). Much more manageable if I can break them down by Genres first, and since now we can have multiple Genres per song that's even better. Thanks for your ongoing improvements! My skins are working, are you trying to use skins for v2 on v3 PA. Many thanks, I really love the new Poweramp V3! 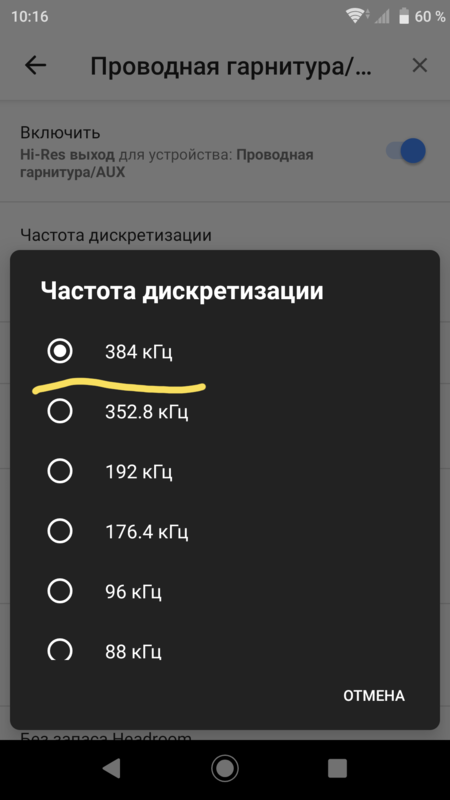 on my android car unit, with 7" landscape screen, all the texts are barely readable, while there is a lot of space available ..
IMHO it doesn't make sense to upscale the sampling rate. If you think you can hear the difference between CD and High Resolution, and you have got money, then buy High Resolution audio and the best headphones available and use the sampling rate that the audio brings. Otherwise stick to 44.1kHz or 48kHz. Getting something similar on HTC 10. If I skip songs quickly, the progress bar will move a bit but the timer stays at 0 and there's no audio. Have to pause/play to get it to work again. I am using the latest 813 build on a stock LG G6. Everything seems to be running pretty smooth now, and this has become my daily driver for music. Thanks for the efforts in building and evolving this amazing player! One item that seems to not follow. I have the option enabled for list click actions to play and go to the main UI, and it works when selecting specific items from within the list. However if using the shuffle or play buttons at the top of the list in the header area, the list UI remains even though the action is executed. Is this the expectation? I would prefer if it would follow the list click action, and in this case move to the main now playing UI same as after clicking on list items. Hi, first of all I've been using Poweramp since 2012 and haven't looked back. This new release is absolutely amazing and a nice change! Everything seems to work great but I do have a couple questions. Is there a way to set it to where when I go to select music that it opens my folders instead of going through the list then selecting folders? And how can I get a full screen visual without my nav and notification bars showing? Thanks again for all the work you do and keeping up on the best music player ever. @Redbear70 While in top Library, click header menu / List Options, then long click any category you want to be a "home" (e.g. Folders). Visualization has 2 modes (with faded controls or just full screen), also for the faded controls mode you can configure controls visibility via settings / Visualization (up to all views transparent or fully visible and everything in between). Fixed for (next build) 814. Thanks for the report. Not at liberty to test right now, just wondering if beeping on play/next/previous action using another app (with media signals i assume) is fixed in this build? I posted it in another build when it happened, and it wasn't fixed in 812. Happens even when no headset is used, so it's mildly annoying to have beep every time i change song with the custom widget i use, instead of use the notification or open Poweramp to fix change songs. Since a couple of versions I have the problem that my car radio doesn't display the song information on my radio when connected through Bluetooth. Also I cannot skip tracks using my radio. The current song just stops for a second and then continues playing. This is happening only since 2 or 3 versions. Before that it worked just fine. 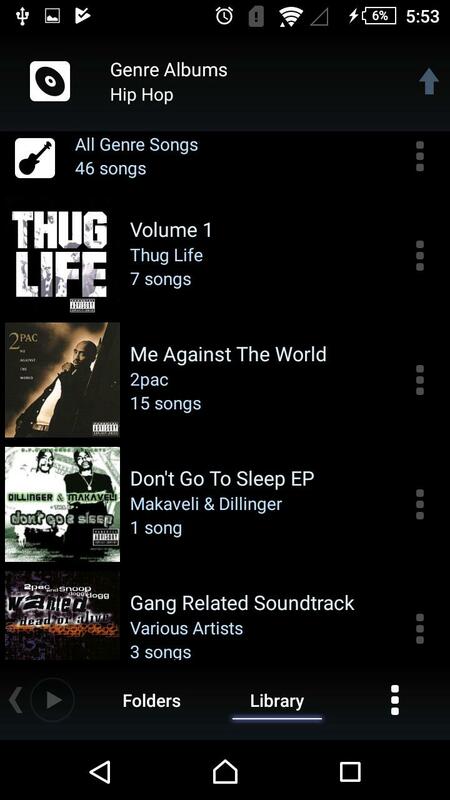 Let me just say first, I think Poweramp is grouping albums perfectly fine. 1. This is Library/Artists/2pac in V2 (left) and V3 (right). 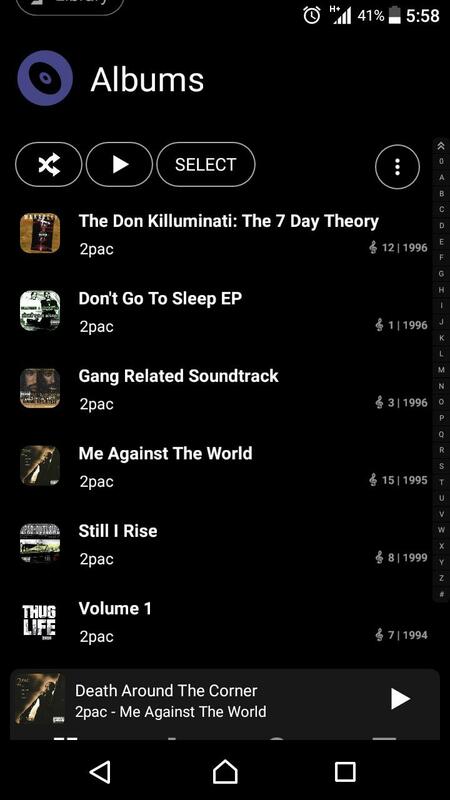 Notice in V2 the album artists tags are shown instead of artists tag making it clearly distinguishable what albums are Various Artists or side projects. V3 looks like one artist across the board because you can only see artist tag when viewing albums. Also V3 picks the last song artist name to display under the album that should say "Various Artists". In most instances it makes it look like a soundtrack or compilation is by one artist. This is a major bug for me and others that carries over into multiple categories. 2. 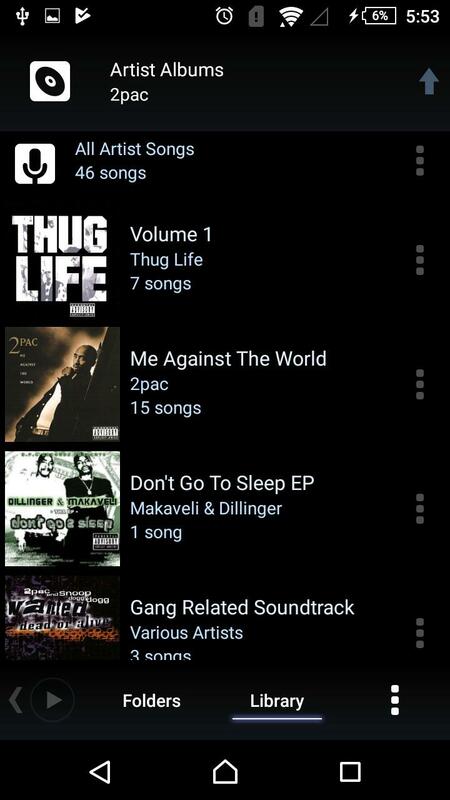 This is Library/Genre/Hip Hop in V2 (left) and V3 (right). Same issues as the category before. 3. 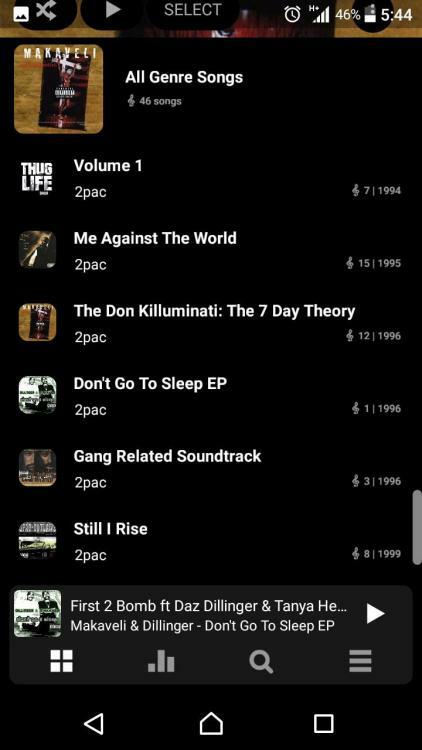 This is Library/Albums in V2 (left) and V3 (right). Again it has the same issues as the other two categories. 4. 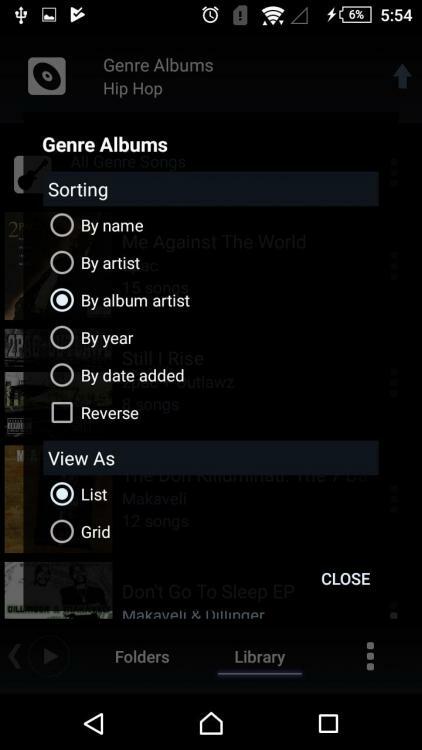 Besides being able to clearly see the album artist tag in these three categories above, you could also sort by album artist tag. This is not one I ever used but this is the other feature people are requesting. 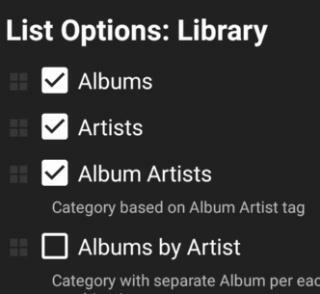 The problem with using Album Artists category and Albums by Album Artists category as a substitute is they only work for Various Artists albums. Otherwise if you have your library tagged a little more advanced like some of us do it scatters albums all over the place by breaking apart one artist into many different ones and will be largely separated depending on the size of your library. It also removes artists songs from where they should be. For example some 2pac songs from compilations would no longer be in 2pac, they would now be separated and listed as Various Artists. Another problem with Artists category and Genre category is they break the albums into multiple pieces that make it look like you have multiple albums by the same artist by not being able to see that album artist tag. 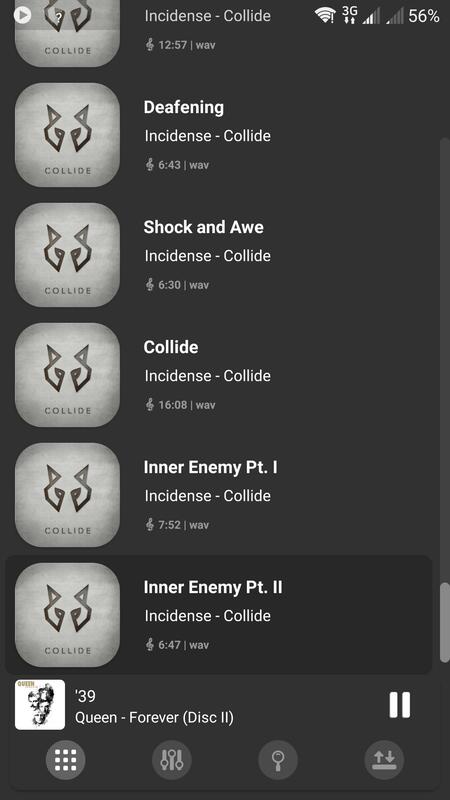 It wouldn't be bothersome if you were able to see that there's a artist difference like V2 shows and not look like a bunch of discrepancies or errors in the app. These being the two most popular categories makes this a problem for a lot of people. The sorting was probably removed on purpose to hide the Unknown Artist bug. I get that part. But can't the "Show Album Artist tag over Artist tag (If Exists)" apply when viewing albums too? That shouldn't affect grouping or sorting?